Cliff Falls, Firewater Falls and Rockcliff Falls occur along a pleasant 2.5-mile loop trail near Ceasars Head State Park that can be an alternative to the extremely popular Raven Cliff Falls. Follow the purple-blazed Frank Coggins Trail (#15) for .8 mile to reach a footbridge at the top of Cliff Falls. At this point, the Coggins Trail connects with the yellow-blazed Rim of the Gap Trail (#6) and the pink-blazed Naturaland (Natraland) Trust Trail (#14). Turn left onto the Rim of the Gap Trail and follow for 100 feet to a steep, short side trail to the left. Take this side trail to view the upper tiers of 50-foot high Cliff Falls. Notice the undercut rock to the left of the falls. Backtrack up the Rim of the Gap Trail to the Naturaland (Natraland) Trust Trail and climb up the pink-blazed trail through a rhododendron thicket. In .3 mile, you'll reach Firewater Falls on your right. The name comes from the remnants of an old still that used to sit atop the rock. 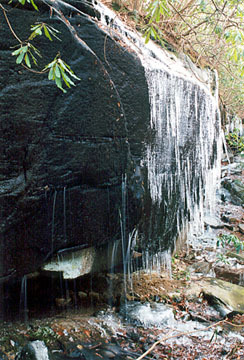 Archaeologists have found that Indians frequently used the shelter cave at the base of the boulder. Continue up the trail .2 mile to reach US 276. Cross the road and follow the trail as it runs parallel to the highway. Look for the pink blazes on the rocks and trees as you make your way through a boulder field. 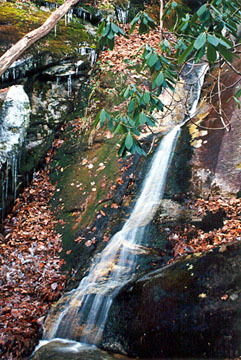 After the trail crosses a gravel driveway, descend .3 mile to reach 40-foot high Rockcliff Falls. Notice the shear cliffs down the trail beyond the falls. Backtrack to where the trail crosses US 276. Walk along the road for .5 mile to complete the loop and return to the state park. Caesars Head State Park is part of the Mountain Bridge, a 40,000-acre wilderness preserve in northwestern South Carolina. Numerous hiking trails crisscross the area. For more details, consult the Mountain Bridge Wilderness trail guide produced by the Naturaland Trust. Directions: From Caesars Head State Park on US 276 in northern Greenville County, walk across the road from the park store / visitor's center to begin the Frank Coggins Trail (#15) on a graveled road. Check with the park rangers for trail conditions. 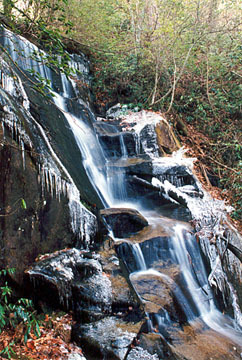 During winter, trails may be icy and some may be closed. Remember to register at the trailhead.